Evo Morales’ remarks came after James Mattis, U.S. secretary of defense, finished his South American tour. August 18 (teleSUR) Bolivian President Evo Morales warned Saturday that the United States is orchestrating a “covert invasion” against Venezuela after the country’s Secretary of Defense James Mattis and Colombian president Ivan Duque declared the “Venezuelan crisis” as a national security threat and Duque agreed to receive a Navy hospital ship to give “humanitarian” amid to help Venezuelan migrants. “We condemn the covert invasion of the United States government, who sending a Pentagon ship to Colombia under the guise of ‘humanitarian aid’ for our Venezuelan brothers. The USNS Comfort ship, with the capacity to transport war helicopters, in a threat to Venezuela,” Morales said in a series of post on Twitter Saturday. It is no secret that the U.S. and Colombia seek to remove president Nicolas Maduro from power. “We will continue with the goal of strengthening a great international democratic coalition that allows us to advance in the creation of conditions to allow the people of Venezuela to choose the government they wish to have in a transparent, democratic and free process,” Colombian Foreign Minister Carlos Holmes Trujillo, said Friday. Maduro was re-elected as president of Venezuela this May in national elections that had international observers. During Mattis’ South American tour the Pentagon chief also visited Brazil, Venezuela’s Southern neighbor. After the impeachment of democratically elected president Dilma Rousseff, the U.S. reached an agreement with the un-elected government of Michel Temer to use Brazil’s Alcantara missile and rocket launching base. 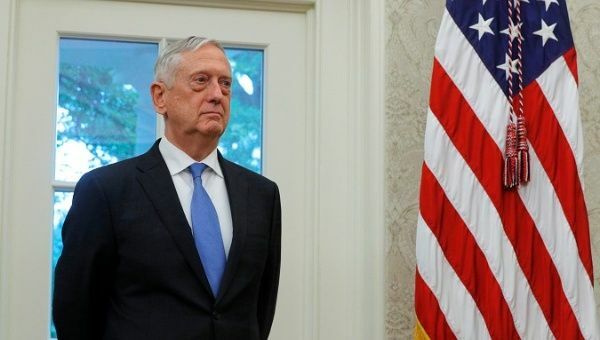 In Brazil, Mattis claimed the South American giant should “lead” the solution to the Venezuelan crisis. On that occasion, Morales also spoke out rejecting U.S. interventionism in the region and stressing Venezuela’s economic crisis is due to the U.S. imposed economic sanctions. On Saturday Morales reiterated “the best ‘help’ is to respect the sovereignty of the Venezuelan people and lift the economic blockade that the North American empire has unjustly imposed. All aggressions against #Venezuela is an aggression against #LatinAmerica,” Morales warned. In the past, the U.S. government has called for a military coup to “restore” Venezuelan democracy. Earlier this month, Venezuelan President Nicolas Maduro was targetted in a failed assassination attempt. Venezuelan authorities have identified the material and intellectual authors and claim they are based in Miami and Colombia. Among those involved in the attack is former legislator Julio Borges, who is residing in Bogota. The Venezuelan government has requested his extradition. Mattis’ South American tour took place on the backdrop of the deepening crisis of the Union of South American Nations (Unasur), the only regional integration body with no U.S. presence. Unasur has played a vital role in securing peace for the region and avoiding intraregional conflict through its Defense Council, which brings together the region’s top defense authorities to fight against common threats. On Friday, president Duque reiterated Colombia’s decision to withdraw from Unasur permanently. A move endorsed by Chile, a country Mattis also visited.